Previous “final” hearings ended up not being final: this one is expected to REALLY be the last one. The judge indicated (in November) he was ready to make his decision contingent on outcome of background checks. The government attorney had said (November 7th 2017) that he didn’t have the background check results yet; he expected them “imminently” – just waiting for the phone call. However, when pressed by the judge, said he expected the results for sure by that Friday (11/10/2017). The judge said he wasn’t going to make Chaudhrys, community at large and so many supporters come back a second time in the same week! The background checks were not completed until about the second week of January! We look forward to your presence for this final [immigration] hearing ! Thanks to the great supporters who actually, really & meaningfully showed care by their actions; who gathered for rally and spoke from their hearts. 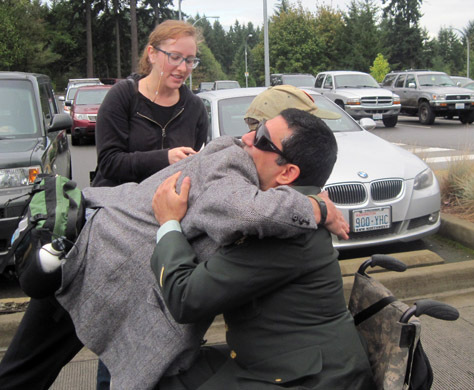 Many Thanks to drivers for transporting many from Olympia area to Seattle and safely back. Many Thanks to those from Seattle and those who traveled from other areas, States and Countries who joined rally & courtroom support. Many Thanks also to those unable to attend, but holding all in prayer and as Quakers say: “in the light”. Many Thanks to those who wrote support letters. UPDATE: Yes, October 16th was to be the final hearing, but ended as the “Pre-Final” hearing. 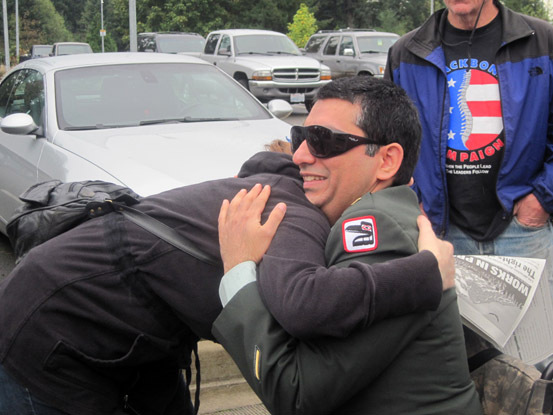 Despite Judge Paul deFonzo’s ruling in July to have October 16th the final hearing, ICE attorney saw that he was losing during October 16th hearing; so to save face and cause additional delay, he threw a monkey-wrench – causing yet another hearing set for November 7th, 2017 – 8:30 am (Seattle). Judge deFonzo had already admonished ICE attorney that he (attorney) had been given lee-way to ask few more questions based on Judge’s questions; but, Judge said to ICE attorney, his questions were going too far astray. Some have already stated that ICE is very over zealous and must be getting extremely desperate to cause yet another delay. However, the longer this goes on, ICE (and its persecution) makes itself look even more ridiculous. To see & read more, especially read new information on “CARRP” and “UPDATES” tabs on both websites. Keep your calendars marked for November 7th, 2017 – 8:30 am. 1000 2nd Ave, Suite 2500, Seattle. ICE does not want folks witnessing, that way they can not get away with anything they want ! In July, Judge deFonzo indicated this October hearing would be the final hearing and he would make a decision. 1000 2nd Ave, Seattle, WA 98104 (corner of Spring & 2nd Avs) in front of building. Courtroom: Upstairs in Suite 2500 You will need time to go through security at court area. Court starts promptly at 1 pm. 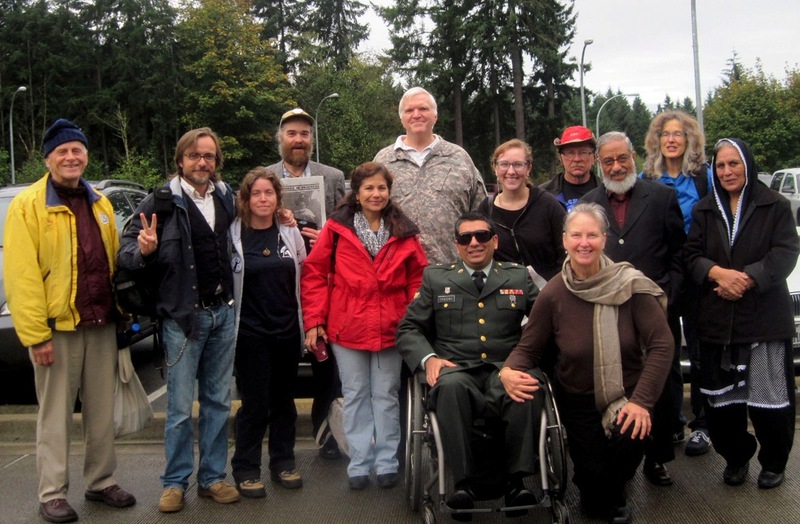 Olympia/Lacey area: Meet up at Martin Way Park & Ride near exit 109 no later than 9:50 a.m. Van and car pools leave from 4701 Martin Way E. Lacey, WA 98516 promptly at 10 am. If you plan to catch a ride in the van, please do not wear cologne, perfume, heavy-scented lotions. Your support and solidarity for this nearly 15 year heroic challenge for expedited, qualified naturalization is greatly appreciated! The previously secret CARRP, USCIS’ illegal/un-Constitutional, immoral and unethical policy which predominantly targets those aspiring Americans who may be Muslim, perceived to be Muslim, who come from perceived predominantly Muslim countries, who may have technical and/or multiple language skills, who may show leadership qualities, or may have contributed to a charity that was later deemed (by US) to have provided support to terrorist organizations, or even if the applicant has traveled through areas of known terrorist activity. Thanks to All those who attended the vigil and court hearing on Monday the 20th (2014) ! 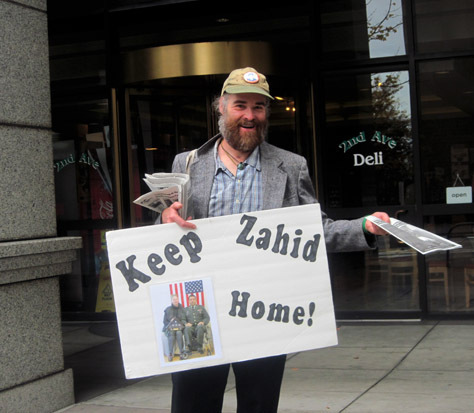 And for showing the court and Department of Homeland Security that we are a peaceful, loving and caring community of supporters, friends, family, veterans, activists, young and elder, from all segments of this wonderful, diverse community to KEEP ZAHID HOME ! Thanks to organizers, email-blast specialists, drivers and riders, those that braved the bus lines & traffic etc., the signs holders, the banner holders, the WIP distributors, VFP 92 Seattle, those that contributed in many ways, those who could not attend and held Chaudhrys & all in their prayers, light, energy, blessings. 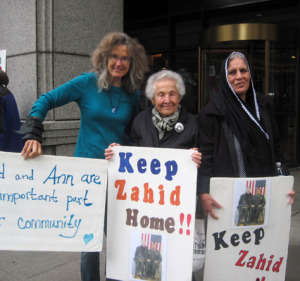 The love & support you have shown Zahid and Ann was clearly noticed by the court & all others. 1) Monday’s hearing was regarding an ambiguous “check” mark on a pre-“9/11” Yakima Police Department UNPAID, volunteer position application. Yes, that long ago: over 13 years ago ! 2) The department’s case was unraveling from several arenas; not the least of which was the deposition from former YPD officer Gary Belles, in which he stated he had made markings all over the application & personal history statement, including (but not limited to) “check” marks. Gary Belles had also said he had already planned not to hire Zahid – yet brought him back in for a “ruse” secondary interview. Gary Belles had been required to appear over the years at the same court, when he did not. The Department tried to convince the judge to accept Mr. Belles’ testimony via phone. The judge had declined and set the hearing date so far in advance so as to ensure he would be present; as, he said, Mr. Chaudhry deserved to face his accuser. 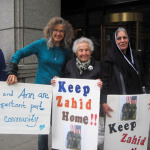 3) Perhaps seeing their false accusation/s exposure to the light of day, their whole case unraveling & falling apart, supporters & whole community bearing witness (Court of Public Opinion) at the vigil on Monday morning gave the Department further cause to make a last moment offer to Zahid’s attorney. 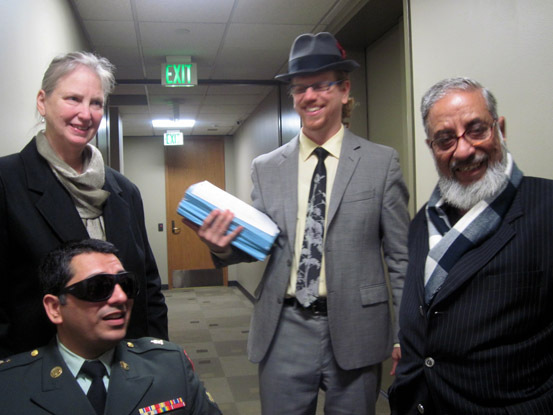 4) While supporters were patiently processing through the security at the court, Chaudhry’s attorney arrived to say the Department offered to drop the whole “check” mark issue in exchange for some other minute partial admittance. 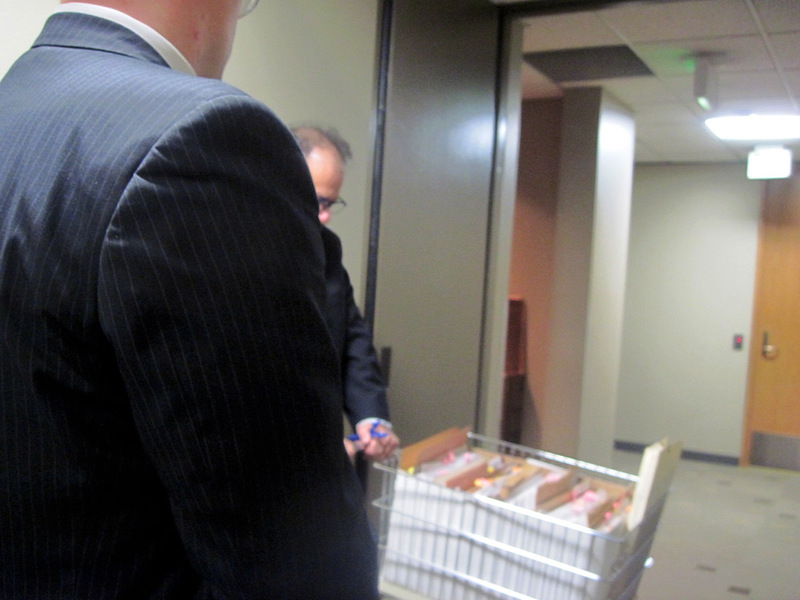 5) The judge appeared to be in good mood at this hearing; stopping proceedings numerous times for attorneys to discuss together, find/retrieve (and make copies – see point 7) documents, and make sure everything was understood & agreed to. 6) Two attorneys from ICE (Immigration & Customs Enforcement) were present: Mr. Love, who had to be reminded by the judge to speak into the microphone; and Mr. Eric Pederson, who was abrasive, brash and his actions were clearly intentionally divisive. 7) Judge DeFonzo, upon reviewing documents in his file, came across the signed subpoena for Mr. Gary Belles, which neither Chaudhry’s attorney nor Chaudhrys had “ever” received from the Department; and upon being asked by Judge time & again, ICE attorneys did not have any willingness to co-operate with the Judge or the proceedings and would not even give a copy to Chaudhry’s attorney. The Judge stood up, left the hearing to make a copy from his papers and presented it to Chaudhry’s attorney ! 8) Mr. Pederson un-ashamedly attempted to prevent some court filings like newspaper articles documenting the despicable hatred, bigoted actions, racial slurs Gary Belles has towards all minorities, inciting xenophobia, law suits, and millions of taxpayers’ dollars City of Yakima wasted defending their star witness were 10 years old; and the other large document, CARRP (Controlled Application Review & Resolution Program – aka: “Muslims Need Not Apply” – How USCIS Secretly Mandates the Discriminatory Delay & Denial of Citizenship & Immigration Rights to Aspiring Americans). 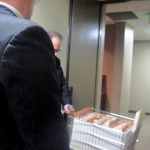 The Judge, after looking through the documents, overruled Mr. Pederson’s objections and entered the filings into the record saying he felt they were relevant and material. 9) Judge DeFonzo mentioned several times how this case has gone on for way too long. He thanked & verbally acknowledged his appreciation for the supporters in the courtroom which is very unusual. 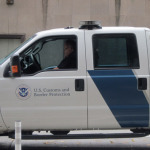 USCIS (US Citizenship & Immigration Services) will not admit to the existence of CARRP and creates parallel files on applicants for naturalization. So as the Department is delaying, denying, and looking for reasons to deport applicants, they create a parallel profile against applicants in order to charge them with “removability” (Orwellian-speak for ‘deportation’). See the video and read the reports of the CARRP program on NEWS page of this website. The immigration court had 3 judges, one of which has already retired. Another judge is soon to retire, leaving Judge DeFonzo handling an overload of cases. That’s why the next Individual hearing is not likely to be scheduled until sometime in the year 2017. 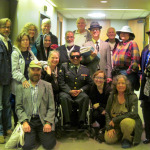 Thank you all again for your legacy of solidarity, peace & justice ! Gather for car/van-pooling from south Puget Sound from Martin Way Park and Ride (4800 Martin Way East, Lacey, WA) at 10:30 am. Questions or sign up for car/van-pool: Contact any member of Keep Zahid Home or Justice4Chaudhry campaign committees or 3six0 529 1109 . If you plan to be in the courtroom at 1 pm, please remember to bring as few belongings as possible; bring gov. ID; to give yourself & others plenty time to go through security checks. 5-And Mr. Belles went around agitating & creating xenophobia in fringe groups (including, but not limited to: county militia, anti-immigration & anti-minority groups, etc.) wanting ‘kudos’ & ‘pats on the back,’ telling them he was the one who went out of his way to make sure Chaudhry wouldn’t have any future in any city or county jobs, even volunteer, unpaid ones. There will be a peaceful vigil & solidarity rally for justice outside the court building on the street; unless this court date is either changed, cancelled or made moot by US Supreme court favorable decision (on Zahid’s pro se writ certiorari) which is expected any time soon. See US SUPREME COURT webpage of this website for details on pro se writ certiorari. 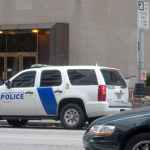 The immigration court is under the umbrella of the Department of Homeland Security and is currently housed on the 25th floor at 1000 2nd Ave. , Seattle, WA . However, this “immigration” court is not necessarily geared towards immigrating. 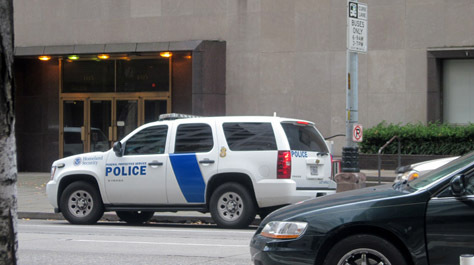 ICE (Immigration & Customs Enforcement) is also located in the same building. Check the NEWS page and read the reports, listen and watch the video “Muslims Need Not Apply” – the unconstitutional, illegal, immoral, unethical and secret CARRP program created by USCIS (United States Citizenship & Immigration Services). Only Congress can create laws, however USCIS has blatantly circumvented Congress and created its own secret, unconstitutional, illegal, immoral and unethical program to determine who gets to be a citizen of the United States and who does not. This secret (CARRP) program directs (USCIS) officers to delay, deny and then look for reasons to deport. “Unfortunately the Ninth Circuit has denied rehearing [See “Ruling” in next section below]. They did not state why or give any reasons. I am very disappointed as they clearly misapplied the law to the case and continued the injustice you and your husband have faced earlier in the case. My candid analysis is that the court was looking for an excuse to justify their decision and when the one they came up with ended up being legally wrong, they were silent and had nothing to say. You have until March 19, 2014 to have such a petition filed but, I recommend that if you want to undertake such a petition that you do it in January because of the time, money, and logistics that is involved. The Justice4Chaudhry Campaign Committee joins legion of supporters around the world who are all deeply saddened and disheartened by the miscarriage of justice from the 9th Circuit Court of Appeals. “Before: HAWKINS, McKEOWN, and CLIFTON, Circuit Judges. The panel has voted to deny the petition for panel rehearing. Judges McKeown and Clifton have voted to deny the petition for rehearing en banc, and Judge Hawkins has so recommended. The full court has been advised of the petition for rehearing en banc and no judge has requested a vote on whether to rehear the matter en banc. Fed. R. App. P. 35.
and it is a strange notice, indeed. Across the top of the first page, “NOT FOR PUBLICATION” is typed. In addition to this odd decision and disposition, disappointedly, the three judges (most notably, the judge that was not actually present at the hearing, Clifton) of the 9th Circuit “affirmed” the Federal district court’s decision and did not rule for citizenship. There is no explanation as to why the disposition is not appropriate for publication and is not appropriate for precedent. Stayed tuned for further updates. who Stood on the Noble Side of History for Justice !!! So many thanks go out to everyone who got going at the crack of dawn Monday morning to car-pool up to Seattle. And to the many, many all over the World sending their prayers, best wishes, solidarity, support, and holding us in Light and Love. 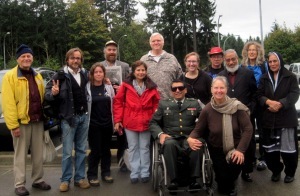 Many, many thanks for our drivers who transported us all safely to Seattle and back. Great big hugs and thanks to the huge fabulous group that met us at the Park n Ride, and those who met up with us from Seattle areas. 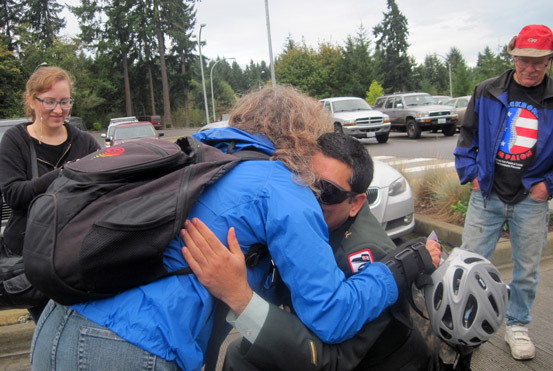 We are also very grateful for the efforts of those who left their home and missed the car-pool connections; some made their own way to Seattle; some met & joined us in Seattle. Supporters and solidarity warriors stood firm at the front and back of the William Nakamura Federal Courthouse. Agents and vehicles from DHS quickly amassed to ogle and harass peaceful, fun-loving, hugging, laughing, smiling, picture-taking vigil-ers holding signs to “Keep Zahid Home !” and “Due process, not Screw Process for Chaudhrys!”. Entry line at the front entrance of the building was long and tedious; some were removed from the line for speaking truth; some weren’t able to enter due to misplacement of I.D. 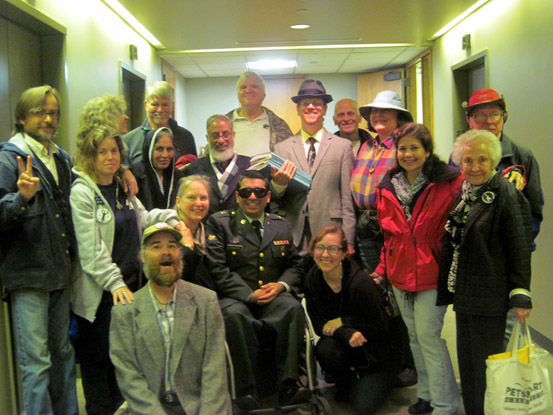 However, many (from age 1 to 70+ and all in between) eventually made it into the courtroom and completely filled it up, even standing in the side aisle and back, too! There were even some left in the hall outside. There were two judges, rather than three; however, we were assured that the third judge would be listening in and be included in the decision. There was no comment or question ever heard from the third judge during the brief 15 minutes each side had. THESE ARTICLES & SPECIAL REPORTS ! CARRP: Controlled Application Review and Resolution Program. Attorney for Mr. Chaudhry, Alex Watham, argued that according to law, the Military Naturalization application “look-back” period, also known as statutory period, is one year (therefore, not prior to April of 2003), and the government’s groping of whole life of applicant was against the law. 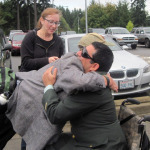 Mr. Chaudhry had the right to his day in court (or at least the illusion of due process of a day in court) which he had already paid expensive court fees many months in advance; and which had been denied him by Yakima’s Federal District Court Judge Lony Suko who granted the government’s “Summary Judgment Motion” to terminate the scheduled week-long 2009 court trial. When the government read the witness list, they wanted to suppress the Chaudhry witness testimony which would expose the lies of the government’s star witness, Gary Belles (Yakima Police Department), whom the City of Yakima had already spent over $1.5 million dollars defending in court for racial slurs and racist actions while in uniform and in public. Alex contended that the court had duty to look most favorably on the non-moving party (Chaudhry) in the Federal District Court, which was not done and a serious error in American jurisprudence. It is virtually unheard of that court would grant a summary judgment motion to the moving party (for those unfamiliar with ‘court-speak’, that means the party who initiate/files the motion). And there was the argument that Judge Clifton brought forward, that the trier of fact should be able to be allowed to make their own conclusion, not have one party (the government) tell them what their conclusion would be. The trier of fact (the court) must draw all justifiable inferences in favor of the non-moving party (Mr. Chaudhry), including questions of credibility and the weight to be accorded particular evidence. The court must assume, in the absence of solid, non-personal/private opinion to the contrary that the non-movant’s (Chaudhry’s) version of the events is true. That is, that used to be the bare minimum standard of American jurisprudence and the basis of the Nuremburg Trials. At the end of the arguments, Judge McKeown stated that the oral arguments were submitted into the court record. That meant, court wasn’t denying the appeal. It may take up to six months for their opinion to become known. It could also be as quick as a few weeks. The opinion will be mailed. arguments before panel of judges. other community members, friends, family, supporters and concerned citizens, so we can co-ordinate car and/or van pooling for everyone. Seattle supporters: Meet us there in front of the Nakamura Federal Building at 1010 Fifth Ave., Seattle. We’re encouraging everyone to join in, show your support and vigil in Seattle. Vigil outside courthouse for about 20 minutes before going to the courtroom on 7th Floor. Picture I.D. is required to enter courthouse. 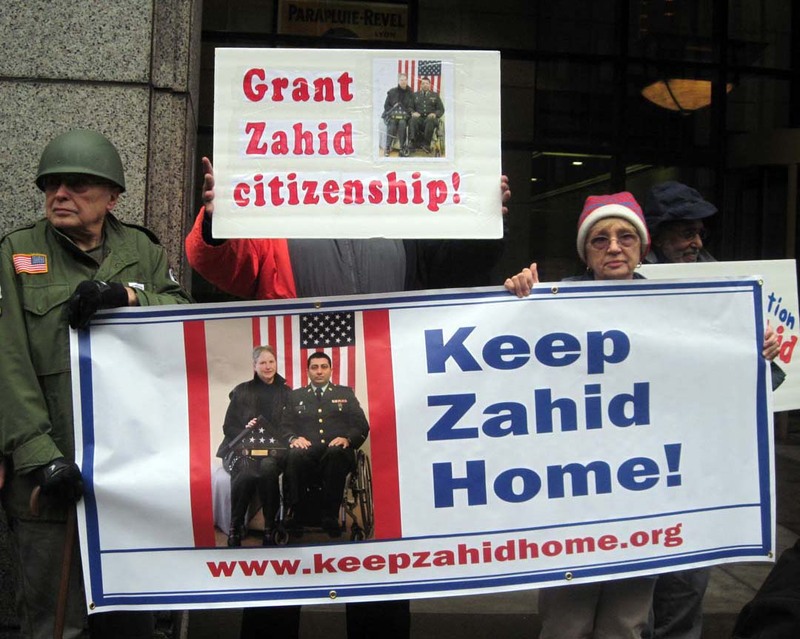 Let’s show the world that we honor and support those who have served our country fearlessly, faithfully and completely and Zahid has earned his citizenship. Chaudhry v. Napolitano Oral Arguments scheduled for August 26, 2013. U.S. 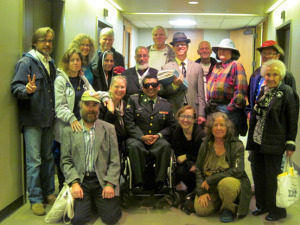 Courthouse located at 1010 Fifth Avenue, Seattle, WA 98104.
encouraged to attend this long-awaited and momentous hearing. belong here at home and we want to keep them at home. For those planning on attending the hearing, remember that picture I.D. Court starts right at 9:00. Watch for updates, opportunities, car/van pools! 9th Circuit Court of Appeals recommends pro bono attorney to represent Zahid in Appeals case; and pro bono attorney is chosen by court. Panel of judges not yet selected at this time. Please keep sending those positive vibes and thoughts and please continue to send letters of commendation/ support/Amicus brief/friends of the court letters to the court. 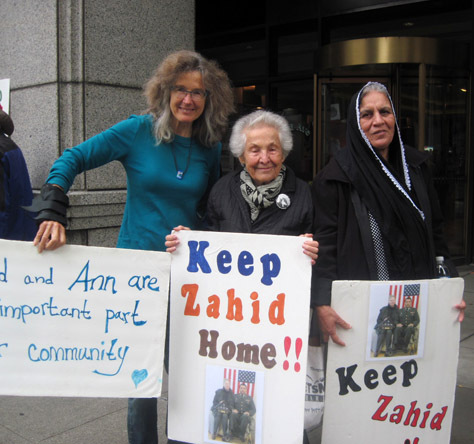 Help Keep Zahid & Ann home. 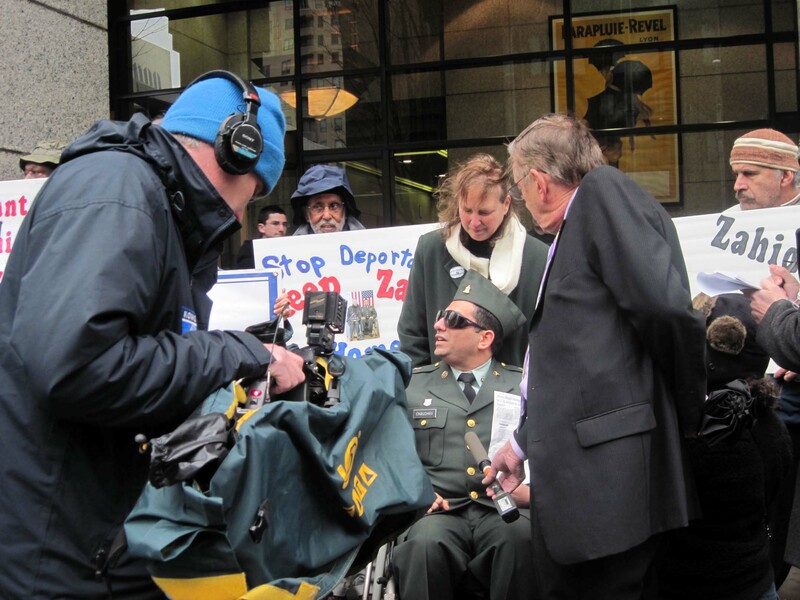 Next “Deportation” court hearing set out to August 27, 2013 !!! On this unusually beautiful and gorgeous Seattle day, folks again rallied in front of the Seattle Immigration courthouse building at Spring & 2nd Ave, bringing the heartbeats of the concierge and security guards to worried high staccato. Yet all was calm, silent and peaceful. No supporters were allowed to enter the courtroom for this ‘deportation’ court Master Calendar hearing: only Zahid’s attorney and Zahid & Ann. This Master Calendar hearing went quickly. The judge, hearing that the 9th Circuit Court of Appeals had not yet made a decision, set the next “deportation” hearing date out to August 27, of 2013. He really wants the 9th Circuit to make a favorable decision so his hands remain clean in this stinky matter. Much gratitude and appreciation to everyone! A BIG Thank you to our drivers and vehicles; thank you to Jodi & Doug for the fabulous pita sandwiches (we’ve put in a plug for your delicious no meat, no heat pitawich to add to Traditions’ menu! ); thank you to all who blew the minds of the concierge, extra cops & security at 1000 2nd Ave. Seattle by calmly & collectively holding signs & banner in a big long line in front of the building and particularly the bravehearts across the street! 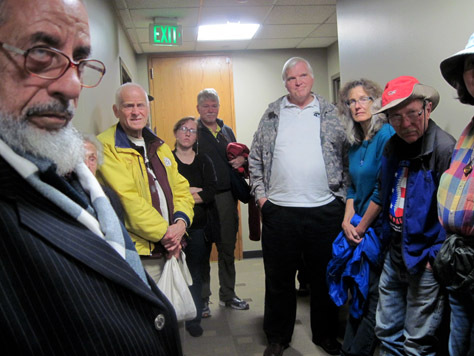 Several of the people who came from far & away and wanted to be in the courtroom were denied access, intimidated & harassed. One student of jurisprudence who insisted that if there is no sitting room inside the court, he was willing to stand; was instead handcuffed, arrested, taken a few blocks away and charged. The bulk of time of this first ever ‘deportation’ court Individual hearing was spent by the Judge marking sections of documents as exhibits. Even at the repeated request of Zahid’s attorney Devin Orr, the judge did not allow testimony from the forensics handwriting expert, even though the expert had taken time out today & had come from far away; nor even from the “respondent” (Zahid). 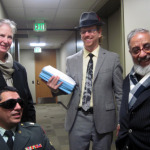 The “service” / “department” (DHS) wanted to cross-question Zahid about articles published about him in Works In Progress and Seattle Met and submitted those in the record. 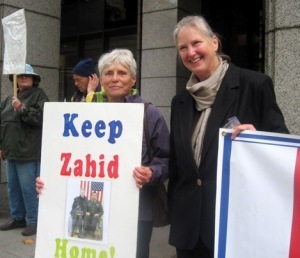 They also tried to get the judge to allow their star witness (xenophobic, racist bigot, Gary Belles, the very person who carried out the ruse and entrapments on Zahid) to testify on 5/24/12 by phone, giving the lame excuse he wasn’t in the court today was because “he can be on call.” This is a huge fabrication, as Mr. Belles’ position is such that he can be away from YPD (Yakima Police Department) – especially to testify – which, isn’t that part of a police officer’s job??? to be present in courts to testify particularly when he is the one who is the root of all the fabricated allegation & ruse and entrapment and raising the red flags on Zahid in the Federal computers??? And what would happen on the opposing side to someone who didn’t show up to a hearing or trial? That person would lose his/her case if s/he didn’t show up to testify! 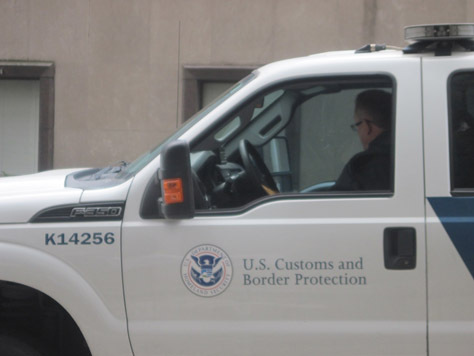 In this situation – grounds for deportation – end of story! Sanctions should have been placed on the service/department, if not outright have the case thrown out then and there! Double standards abounding! The judge said the “respondent” (Zahid) had the right to have Gary Belles testify in court, face to face. The service/department tried to claim a portion of the YPD “ruse” and entrapment interview paperwork was a duplicate and therefore could be removed. Our attorney argued that the printed portion of the two sets was the same, but the handwriting on them were from different interviewers. The service/department tried to say the second one couldn’t be used because the name of the interviewer was not legible; however the judge was able read from his copy the name in addition to Gary Belles– so the judge overruled the service/department’s objection. A translator was also provided who was dismissed when Zahid said he would proceed in English. 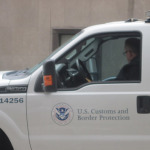 The judge also asked about the status of the 9th Circuit Court of Appeals, saying that the 9th Circuit might soon make the decision to grant citizenship and the deportation would go away. So, we’re back to a Master hearing (with lots of other people in deportation proceedings) scheduled for June 27th (2012). At this future hearing, it will be discovered if Belles has to be subpoenaed to testify in person or if he will stay away, and we’ll also hear the date of the next Individual hearing. The judge set the next hearing for June 27, 2012. 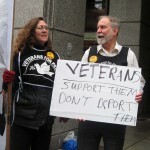 VETERANS: SUPPORT THEM – DON’T DEPORT THEM! 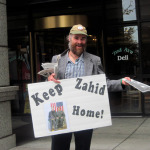 KEEP ZAHID HOME CAMPAIGN NEEDS YOU! 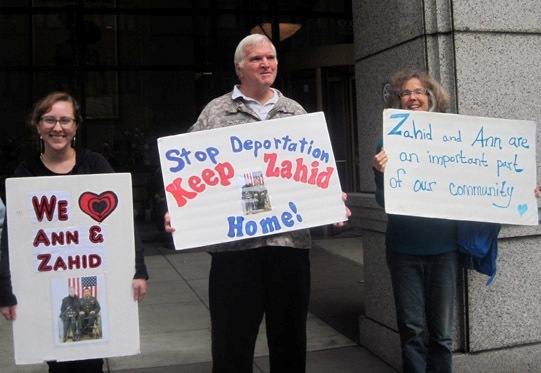 The Keep Zahid Home Campaign & Justice for Chaudhry committee is gearing up for the rally to support Zahid & Ann at the Seattle Deportation (Immigration) Court. 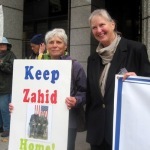 Join many other community members to show we want to keep Zahid here. WHAT: Rally & vigil in front of Seattle Deportation (immigration) Court building & pack the courtroom for hearing. TIME: Van/Car-pooling from Olympia area at 10:30 a.m.
Rally & vigil in Seattle at 2nd Ave. & Spring from noonish to 12:30 p.m.
Head up to 25th floor to the courtroom between 12:30 p.m. & 12:45 p.m.
Court hearing at 1 p.m.
Can you drive and/or provide transportation to/from Seattle? Make copies of this flyer & distribute. v Olympia/Lacey van/car-pooling leaving at 10:30 a.m. sharp from the Martin Way Park & Ride, just off Martin Way and I-5 exit/entrance (near & just before the theater & Shopko). Seattle supporters – meet us there at corner of 2nd Ave & Spring. v This is a Federal court, which requires picture ID to enter the court. v To give everyone time to get through security at the court in timely manner, bring as little as possible. v Court hearing may last for a while; or it may last only a few minutes. Lots of supporters in the courtroom are essential for the pursuit of justice & does make a difference. Please pass this notice on to others. 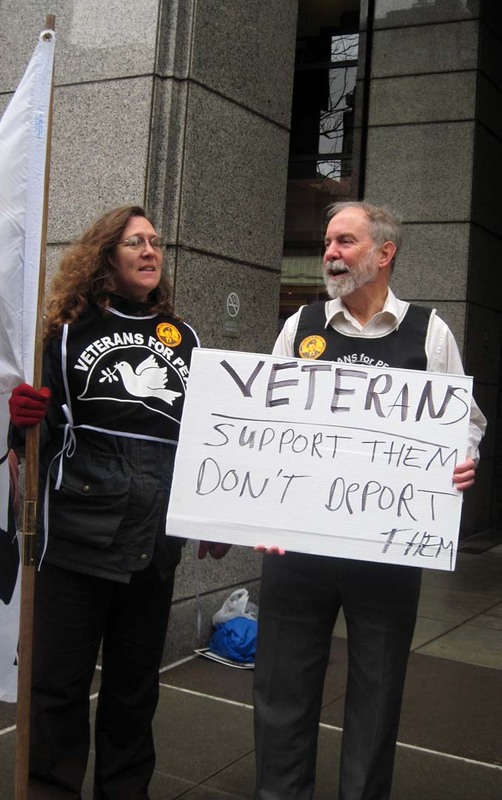 Please contact Sen. Patty Murray, Chair of Veterans Affairs Committee: Seattle: (206) 553-5545 and Sen. Maria Cantwell, Seattle: (206) 220-6400: These are the ones who can actually make a difference & can take actions if they want to, rather than just lip service. We need to tell the politicians we’ve had enough lip service – it’s about time we see concrete actions! You can contact the White House for a possible last-minute intervention at (202) 456-1111 or http://www.whitehouse.gov/contact/submit-questions-and-comments. 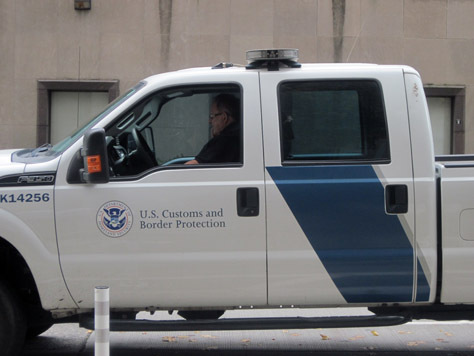 Please contact the US Customs & Immigration (USCIS) Employee Misconduct Hotline at (800) 323-8603 (ph), (202) 254-4292 (fx) or email them at dhsoighotline@dhs.gov. If you have a media platform, please contact Zahid and Ann Chaudhry and have them on your show/feature something in your publication about Zahid’s case in the next week. Last but not least, please keep Zahid and Ann in your prayers during this next week! 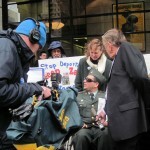 See photos below from April 2011 rally & vigil at the same location. 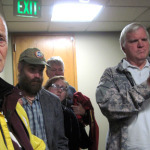 Spring 2012: U.S. 9th Circuit Court of Appeals panel of Judges have not been selected for the Appeal. Please continue your positive thoughts and please continue to send letters of commendation/support/Amicus brief/friends of the court letters to the court. 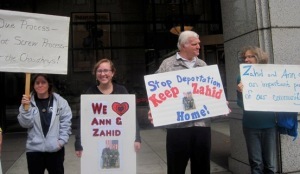 Keep Zahid & Ann home. 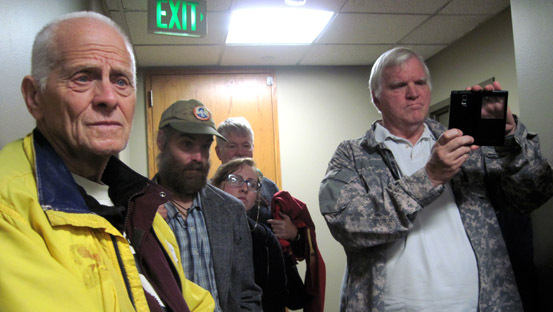 Fall 2011: Upon request, Pro Se over-sized brief was accepted by 9th Circuit Court of Appeals. Please join us all in sending positive thoughts/vibes out that a well-deserved outcome may soon be reached by the 9th Circuit Court judges for the sake of justice and a favorable decision. Or as you feel compelled, or your heart directs: send letters of commendation/support/Amicus brief/friends of the court letters to the court in support to grant Zahid citizenship, and that a glorious outcome may soon be reached by the 9th Circuit Court judges for the sake of justice for a favorable decision to KEEP ZAHID and ANN HOME! 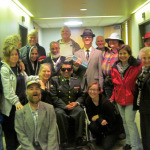 4/18/2011: Individual hearing court date set for May 24, 2012! More info coming as date nears. 4/1/2011. 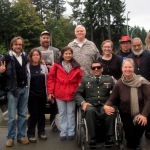 From Chaudhry family: Senator Maria Cantwell’s Washington, D.C. office & Seattle office just had a conference call with the Chaudhrys & they are very hopeful that it will get resolved soon to Chaudhry family’s satisfaction. Thank you Chris in Seattle office & Claire in Washington, D.C. office!! May we all have a great weekend. 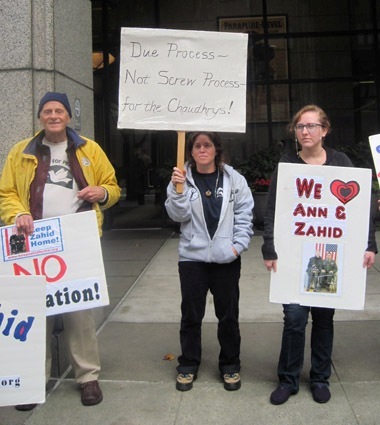 Senator Cantwell gave all the people present her personal commitment and said “Let’s work on this in earnest & get this matter resolved.” Then she said,”It is between David & Goliath, and I’m on David’s side,” as she pointed to Zahid. Past court hearing April 13, 2011: Judge Paul deFonzo sets next hearing for May 24, 2012. Wednesday, April 13, 2011, at 1:00 pm. 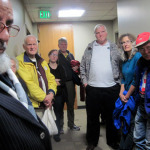 This hearing took place at the Immigration Court (actually: “Deportation Court” as they only determine to deport or not) located at 1000 2nd Ave., Seattle. Spc. 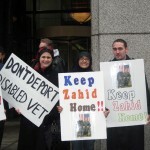 Muhammad Zahid Chaudhry is a decorated National Guard and US Army Veteran who sustained injuries in the military that left him in a wheelchair. 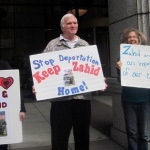 Despite his qualified military service, which should have expedited his citizenship, and despite having been married to a US citizen for over 12 years and being a Legal Permanent Resident, he is fighting deportation to Pakistan. 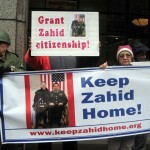 On Wednesday, January 12, 2011 Zahid faced a master hearing in Immigration Court in Seattle. Zahid is one of thousands of US Military Veterans who are wrongfully being denied US citizenship and are instead in deportation proceedings and/or have already been deported.